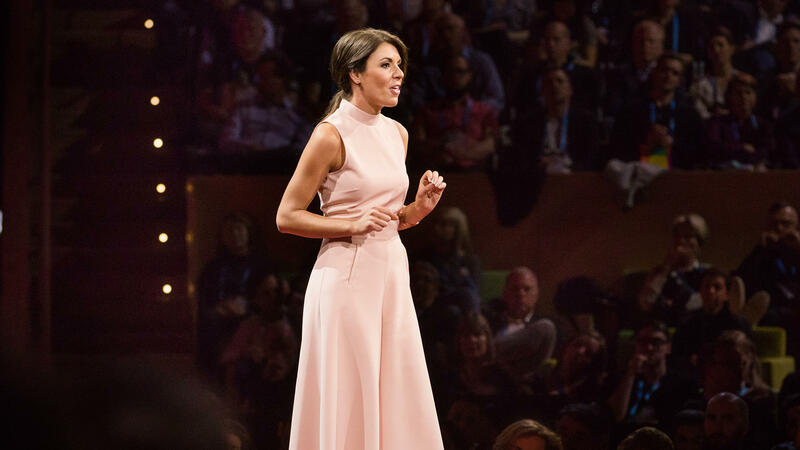 Laura Galante on the TED stage. Part 3 of the TED Radio Hour episode Truth And Lies. What makes us susceptible to fake news? Laura Galante says its our ability to choose what information to believe - something foreign governments can use for their own benefit. Laura Galante investigates how states, intelligence services, and criminal groups utilize cyberspace to pursue their own interests. She is the founder of Galante Strategies, an organization that assists governments and corporations in responding to cyber and information threats. On the show today, Truth and Lies, ideas about what happens when the truth gets distorted in such a way that it makes it kind of hard to tell what's real. LAURA GALANTE: And in this case, it's questioning whether the elections in the U.S. are fair, questioning whether the democratic institution that's most seen at the heart of legitimacy for the American presidency is all a sham. RAZ: This is Laura Galante. She's a cybersecurity consultant. GALANTE: I discuss cybersecurity and kind of the intersection of politics and technology. RAZ: And Laura's talking about the hacking and the leaks that happened during the U.S. election in 2016. UNIDENTIFIED WOMAN #1: There is renewed confidence that Russia is, in fact, behind these cyber break ins. UNIDENTIFIED WOMAN #2: Efforts to damage the political process in the United States. UNIDENTIFIED MAN: By foreign hackers to influence the election. RAZ: So just a refresher, last summer, the Democratic National Committee was hacked. And a collection of emails from senior Democratic leaders was leaked and then published by WikiLeaks. And some of those emails made it seem like the DNC wasn't neutral in the primary election battle between Hillary Clinton and Bernie Sanders. GALANTE: And when that information goes public, the way that that gets picked up by the press and the way that those emails are portrayed start to play into that very concept that the U.S.' process and the concept of voting was all sort of a sham or being puppeteered by the parties and wasn't something that was really organically based on people's sentiment and their vote in the primaries. So I think what you see is an opening that the Kremlin was interested in figuring out how to exploit, which is a lack of trust in the standard institutions that America had seen and trusted for its democratic process. You're never going to get, with any of this and particularly with Russia, Professor Plum in the parlor with a pipe, right? But what was clear is regardless of the outcome, Russia stood to benefit if the U.S. political system was in chaos. RAZ: And by seeding doubt in America's democratic institutions, the hackers created a climate, a climate that made it more plausible to deny the truth. And the Internet made that process happen seamlessly. GALANTE: The dependence that we have for not just our news but really for how we're thinking about our collective experience as people and as a country and as a world is just so intensely derived from the Internet right now. Your smartphone is more your reality than walking down the street. So it's now time to figure out what seems fake, what seems real, why that's the case. And you don't yet have the same Spidey feeling or, you know, goosebumps on the back of your neck that you get when you're walking down the street and there's a shady character walking down and, you know, you're not going to trust something that they say or take it at face value. You don't have that feeling yet on the Internet. RAZ: Here's Laura Galante on the TED stage. GALANTE: As our realities are increasingly based on the information that we're consuming at the palm of our hand and from the news feeds that we're scanning and the hashtags and stories that we see trending, the Russian government was the first to recognize how this evolution had turned your mind into the most exploitable device on the planet. And your mind is particularly exploitable if you're accustomed to an unfettered flow of information now increasingly curated to your own tastes. This panorama of information that's so interesting to you gives a state - or anyone, for that matter - a perfect back door into your mind. It's this new brand of state-sponsored information operations that can be that much more successful, more insidious and harder for the target audience - that includes the media - to decipher and characterize. If you can get a hashtag trending on Twitter or chum the waters with fake news directed to audiences primed to receive it - all tactics used in Russian operations - then you've got a shot at effectively camouflaging your operations in the mind of your target. This is what Russia's long called reflexive control. It's the ability to use information on someone else so that they make a decision on their own accord that's favorable to you. RAZ: Why - why are we so susceptible to that kind of manipulation? GALANTE: We love - particularly in the West - we love having all of this information coming at us that we get to kind of pick and choose what we like, right? So the more that we have this sort of buffet of information at our fingertips and we get to choose what pieces we want to consume, the more we feel like we've helped construct our truth. But if there's two dishes on that buffet that never would have been there naturally - right? - or look extra enticing, we're more willing to choose them. So in a sense, because we are so accustomed to this kind of unfettered flow of information, it's given a malicious actor the ability to have that kind of seamless blend into the panorama of information that's in front of you. And if something fits with how we want our world to look through our rosy-colored glasses, then that information seems a bit more credible. GALANTE: We must recognize that this place where we're increasingly living which we've quaintly termed cyberspace isn't defined by ones and zeros, but by information and the people behind it. This is far more than a network of computers and devices. This is a network composed of minds interacting with computers and devices. And for this network there's no encryption, there's no firewall, no two-factor authentication, no password complex enough to protect you. What you have for defense is far stronger. It's more adaptable. It's always running the latest version. It's the ability to think critically, call out falsehood, press for the facts. And above all, you must have the courage to unflinchingly pursue the truth. RAZ: I just can't get past this idea that we are so vulnerable as a species and as citizens, that we're so vulnerable to believing misinformation, to believing lies. I mean, you think about history, and we look back at these black-and-white reels of, like, Italians, you know, cheering on Mussolini and Germans cheering on Hitler, and we think, oh, God, how stupid could they have been? I mean, gosh, we would never do that today. And some of this stuff makes me think, well, is that true? GALANTE: I think there's a Reagan quote that is we're always one generation away from losing our freedom. RONALD REAGAN: Freedom is never more than one generation away from extinction. We didn't pass it on to our children in the bloodstream. GALANTE: It's very easy to forget how hard people fought to live in a place where you could say what you wanted to say and you wouldn't be - feared to be in jail or - you know, or political dissonance was something that came with, you know, a good, healthy democracy. These concepts aren't something that are granted to us. They are not unalienable rights. They're something you fight for. And if we can collectively reassert that we want a democracy that is based on these principles without having to go through a war, without having to have World War II, without having to have the Dark Ages to get to the Enlightenment, without having to, you know, have a massive, all-out fight, then I think that will be the ultimate mark of whether we've overcome this as a species. RAZ: Laura Galante is a cybersecurity expert based in Washington, D.C. You can see her full talk at ted.com. REAGAN: And if you and I don't do this, then you and I may well spend our sunset years telling our children and our children's children what it once was like in America when men were free. RAZ: On the show today ideas about what's real and what's not. I'm Guy Raz, and you're listening to the TED Radio Hour from NPR. Transcript provided by NPR, Copyright NPR.